For parents of 2-6 year olds who are looking for a colorful and comprehensive look at the ancient cultural traditions surrounding the Chinese New Year binding family celebrations at the heart of the festival, here is a book that explains many of them for the younger group, using an appealing, hands on approach. Kids love to lift the flaps and discover. 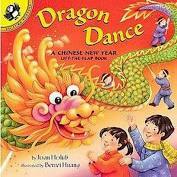 In Dragon Dance, there’s lots for everyone to do in the preparation for the welcoming of the New Year whose date is determined by the Chinese lunar calendar, and much to enjoy during the ensuing festive celebrations. Whether it involves shopping for fresh flowers at an outdoor market, eating New Year’s dinner with the family, or receiving the much awaited traditional red envelopes containing money from one’s parents, grandparents or close relatives, family is the focus of the fun. I’ve read that some children awaken to find red envelopes under their pillows, the contents of which, may or may not reflect how good they’ve been during the previous year. Red happens to be the luckiest of colors in Chinese culture. Its meaning is loyalty, success happiness, and prosperity. Red gifts signify wishes for good luck in the year ahead. So, you may want to have young readers wear a red belt, socks, shoes, red clothing or, even red underwear, which is high on the list for clothing to celebrate the holiday. But, with one caveat however; it should be purchased for you by a friend, spouse, or family member. And naturally, the best of course, is saved for last – watching the New Year’s parade. For the smallest of celebrants, this picture book may just be the perfect introduction to 2019 Chinese Year of the Pig that begins on February 5th. And here are are just a few bits of information on the Chinese Zodiac that determines the twelve animals and the year that they appear in the Chinese calendar. Myth has it that the Jade Emperor dictated the order of the animals would be the order in which they arrived at his party. And guess what? The porcine party goer came LATE because he overslept!!! Another take on the story says a wolf destroyed the pig’s house and he was in rebuild mode; ergo he was late to the party. The pig is a symbol of wealth in Chinese culture and its chubby ears and face are signs of good fortune as well. In terms of yin and yang, the Pig is definitely yin and also associated with the hours 9-11 in the evening. And, my year of birth is one of those designated as a year of the Pig. Here’s to good fortune in reading some great picture books this year!!! !